Child welfare has been a feature of today’s business inside Westminster as Secretary of State for Work and Pensions, Iain Duncan Smith, made a statement in the House of Commons which outlined a new strategy for measuring child poverty. Not surprisingly, the Conservative government feels this is a positive step, one which they say would help to identify the root causes of child poverty, however the opposition doesn’t agree and sees the move as callous and an all time low for the Nasty Party. We leave it to you to decide whether the government is doing the right thing when it comes to child poverty, or simply looking to slash the deficit at great cost to the nation. Basically they are saying, instead of spending money on poor people, we will fudge the figures like we always do. We have got another 5 years before we have to rig an election again, what can they do about it. This is what politicians do, isn’t it? Rig the statistics to suit their argument. I do have to say though, that I think the ethic that work should pay more than benefits is OK and when I heard Ian Duncan Smith talk at a meeting well before the 2010 election I thought he talked a great deal of sense. ‘Poverty’ is an emotive word and compared to the poverty of the thirties, say, well, we don’t have much idea. There seems to me to be a ‘poverty of the spirit’ as much as anything. I recently watched a programme where two sixteen-stone ladies were bemoaning the lack of money to buy food. It just seemed rather ridiculous. I think there is an argument for defining ‘poverty’, but simply to say ‘we can’t meet our previous targets so we’ll move the goalposts’ is lazy, dishonest and open to ridicule. Targets are OK unless they are adhered to rigidly. Our tick box culture lacks basic commom sense. The goverment moving the goal posts when they cannot deliver is not the answer. 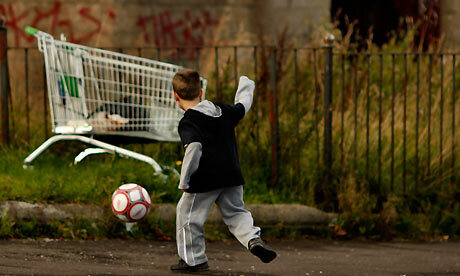 The UK government has consistantly failed to meet its own targets and more families are living in poverty. It’s shameful that we have to resort to foodbanks! Thank you for all your thoughtful comments. My worry is that the government is simply trying to shirk its obligations by resetting the targets, more concerned it seems with being able to tell voters in five years’ time that they have reduced the deficit further and are jolly good chaps for doing so. But whilst the rich may get richer as a result, the gulf between rich and poor may have grown so wide that this ‘victory’ will be pyrrhic. £26,000/ year = poverty ?You must be joking ! Also why do all these immigrants queue up at Calais to live in poverty in UK,? Reblogged this on World4Justice : NOW! Lobby Forum..